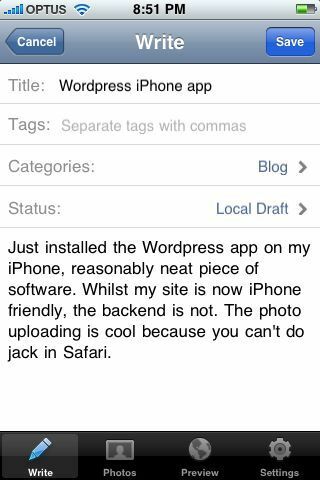 Just installed the WordPress app on my iPhone, reasonably neat piece of software. Whilst my site is now iPhone friendly, the backend is not. The photo uploading is cool because you can’t do jack in Safari. Welcome to /r/ecession fuckers. Technically this means we were in a recession for this quarter, it might already be over but we won’t find out until end of June. Click here if your head just exploded. BRB Have to bust ThePirateBay out of jail. So Rudd announced recently that the tenders for the NBN were finished. Instead of picking a winner, the government announced that it would go it alone with the so called next generation broadband network. Socialist wholesale as it may be, promising Fibre To The Home over the next 8 years. Feasibility aside, the government has chosen a rather reserved promise of 100Mbps, which is actually pretty pathetic given the capabilities of fibre optics. Rudd’s so called next generation broadband is really a game of catch up. Not to say I’d turn the offer down of course. I’m sure things will go swimmingly until the government privatizes the fibre wholesaler 5 years after it’s built, and guess who’ll still be in a position to front that kind of funding and industry leadership track record – yeah, Telstra. P.S. Has anyone even considered the bandwidth in and out of the country? 8500KB/s from a local mirror sure, but as soon you go offshore, we might as well be on plain old ADSL.